Former UNC Chapel Hill Chancellor Carol Folt has accepted a position as the new president of the University of Southern California, it was announced Wednesday. 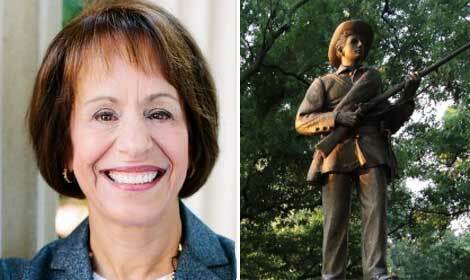 “New USC president Carol Folt removed Confederate statue and faced N. Carolina backlash,” the headline read. That was news to many of the protesters who actually participated in toppling the statue last year. They largely considered Folt an ineffectual leader who didn’t take a strong stand on the removal of the statue by legal means until well after it had been dragged to the ground after months of intense protest. That is true — if that description can be stretched to describe a chancellor who avoided taking a position on the statue for most of her tenure and then ordered the toppled monument’s base removed as she abruptly resigned. The end of Folt’s tenure was in fact marred by the failure of a plan she put together with the UNC Board of Trustees to return the toppled statue to campus to satisfy a state law written to protect such monuments. The plan managed to be rejected by the UNC Board of Governors and ignite new student, faculty and staff protests. In an iconic moment from that tumultuous period, Folt was confronted by Angum Check, a senior at UNC and co-chair of the UNC Black Congress. Angum Check, a senior at UNC and co-chair of the UNC Black Congress, confronted Folt at the head of the lecture hall. As Check spoke, faculty around the room began to snap their fingers in encouragement and support. A number of them stood silently in solidarity with her message. 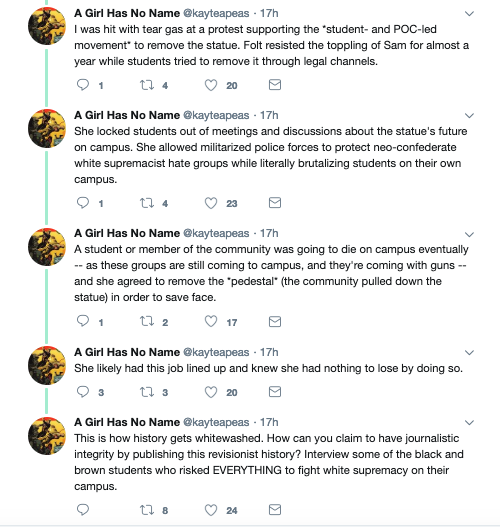 Folt did eventually make a number of strong statements about the monument’s harm to the campus in the weeks and months leading up to her exit. But Folt’s final days in office led many to wonder why she had not shown the strength of her professed convictions on the monument issue until after she had arranged an exit. Students, faculty and community members – especially those of color – have taken to social media to correct the record. It is true that controversy over the monument – and conflict with the conservative UNC Board of Governors – led to the departures of both Folt and former UNC System President Margaret Spellings. It’s true that that the conflict is emblematic of larger conflicts between the board and UNC leaders that experts say are harming UNC’s reputation nationally. But the departure of both leaders was the result of their being unable to navigate the tumultuous political waters of their positions, finding criticism on the political left and right as they attempted a middle path with which few were ever satisfied.